Serve this simple, but flavour-packed salad as a vibrant first course or as an accompaniment to our Sausage, Potato and Onion Kebabs recipe. The avocado and mozzarella make perfect partners for a light summer salad. Arrange all of the salad ingredients in a large, shallow serving dish or salad bowl. Mix together the oil, balsamic vinegar, honey and garlic, season and pour over the salad. 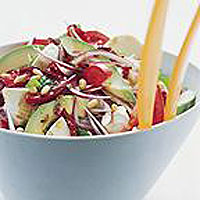 Just before serving, toss the salad to mix well and sprinkle over with some toasted pine nuts. For an alternative dressing, try Avocado and Soured Cream Dressing. It's great for a robust salad or as an accompaniment to grilled tuna or salmon steaks. Using a food processor, whiz together 1 ripe avocado, peeled and stoned, 3 tbsp soured cream, 2 tsp lemon juice and 1 tsp caster sugar. Season and serve tossed with robust salad leaves such as romaine, cos or iceberg, or serve with grilled fish. This recipe was first published in Sat Jul 01 01:00:00 BST 2000.